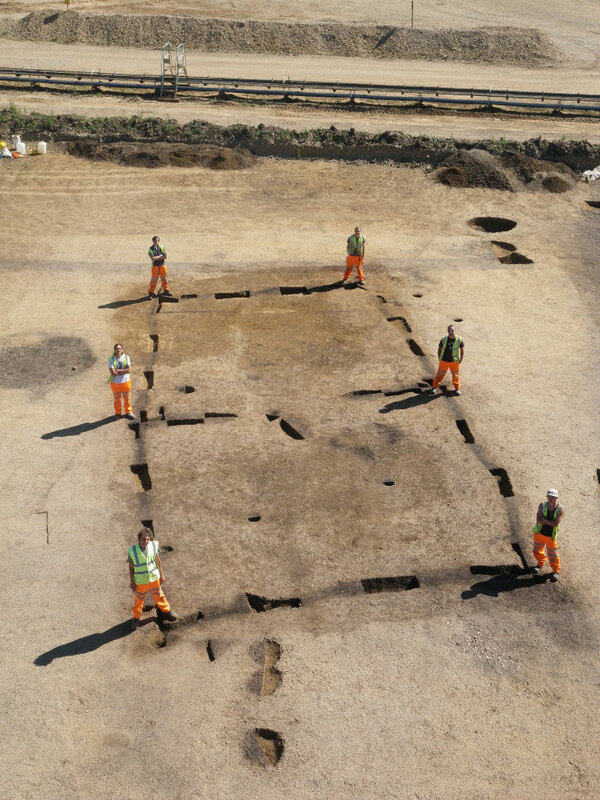 Four early Neolithic houses (3700 BC) have been unearthed by archaeologists at CEMEX’s Kingsmead Quarry in Berkshire. The discovery is unprecedented on a single site in England and challenges our current understanding of how people lived more than 5,700 years ago. This rare find will give us a unique opportunity to learn more about the earliest permanent settlements in prehistoric Britain and how such sites developed. At this time new practices were being adopted with people switching lifestyle from hunter-gather to settled farmer. Few houses of this date have been found in England and rarely has more than one been found on a single site. These discoveries by excavators from Wessex Archaeology are key to enhancing the knowledge and understanding of this period nationally and at a local level tell us more about the history of the area around the Rivers Colne and Thames near Windsor. “Unfortunately only the ground plans have survived as any timber would have rotted away long ago. “However, we have a good idea of what these structures may have looked like from the many house finds in Ireland, from experimental work reconstructing prehistoric buildings, and for wood working techniques from timber-built walkways of the same date, such as the Sweet Track, that were found preserved in the peat deposits of the Somerset Levels. “These finds add to our knowledge of life in Neolithic times and how buildings at that date were constructed,” comments Dr Alistair Barclay, Wessex Archaeology. The houses were probably built by pioneer farmers that had moved into the area bringing with them the knowledge and woodworking skills necessary to construct substantial buildings. The area was ideal for a settlement, it was close to the River Colne and there would have been ample woodland nearby. All the houses were rectangular in shape with the largest being 15 x 7 metres. Two were constructed out of upright oak planks set into foundation trenches, whilst the others were built using wooden posts. Pottery, flint tools, arrowheads, rubbing stones for grinding corn and charred food remains were recovered from the buildings confirming the lifestyle of the inhabitants and the approximate age of the houses. Radiocarbon dating has been used to confirm the age of one of the houses (3800–3640 BC) and further dates will be obtained for the other buildings later in 2013, on the charred remains of cereal and hazelnut shell. The excavations are part of CEMEX’s £4 million archaeological programme on the site, which has been in operation since 2003.